extensive experience in beauty, fashion, and travel. There is no doubt about it, wedding planning can be stressful, but once the date has been set, the ceremony and reception venues secured, and the dream honeymoon booked, you can start to concentrate on the fun stuff, such as shopping for your wedding dresses, tuxedos, and perhaps most important of all, your wedding rings. Creating the perfect wedding day look is something most brides dream of from a young age. The dress, the veil, the flowers, the wedding jewelry, it all needs to be perfect, and there’s a lot of pressure to get it right, but this is the one time in your life when you really get the chance to shine, and so it is important that you follow your dreams and choose a bridal ensemble that makes you look and feel like a million dollars. Wedding dress trends change with the seasons, and brides now have more choice than ever before. From traditional ballgowns and chic vintage creations, to luxurious lace designs and contemporary short styles, there are endless options available for 2018 brides, so don’t stand for second best, shop around, try on more wedding dresses than you ever thought possible, and buy the dress you’ve always dreamed of. It is not only brides who are taking inspiration from the runway this wedding season. Fashion-forward grooms are moving away from traditional morning suits and towards non-traditional tuxedos and designer ensembles that incorporate eye-catching colors, patterns and textures that quietly demand attention. While the classic black tux and crisp white shirt combination will never go out of style, modern grooms are being encouraged to go beyond the black and white and opt for something a little more colorful, which not only distinguishes them from their groomsmen but emphasizes their personality and unique sense of style. So, what should grooms be wearing in 2018? 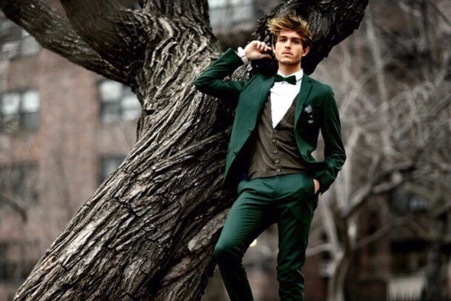 Well, according to the world’s leading fashion designers, grooms and groomsmen should continue to aim for a sharply cut suit with impeccable tailoring, but they should avoid blacks, greys and darker hues, and go for color. The theme for summer grooms is a lighter shade of pale, with cool icy shades of blue, green, cappuccino, and even blush pink (yes, pink!) being popular choices. Winter grooms are being encouraged to go for luxurious fabrics such as velvet and rich gemstone colors such as emerald green, ruby red, sapphire blue and amethyst purple. Bow ties are still popular, but ties, in general, are optional in 2018, so if you prefer not to wear one, don’t. A wedding ring is so much more than a piece of jewelry. It is a symbol of your love, your commitment, and the promises you have made to each other, and if it is to last the duration of your marriage, it needs to be well made, comfortable to wear, and styled to complement your individual taste and unique sense of style. While your wedding day will come and go, your wedding rings are here to stay, and so it makes perfect sense to allocate a larger proportion of your wedding budget to these two very special rings. Traditionally, brides and grooms would exchange simple yellow gold bands to symbolize their union, but wedding ring designs, much like wedding day fashions, have moved with the times, and they are now more beautiful than ever before. 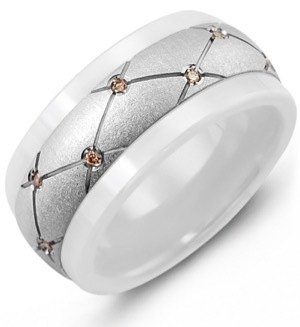 New precious metals and materials such as ceramic, tungsten carbide and cobalt have allowed modern jewelry designers to take wedding ring design to a whole new level. Black ceramic wedding bands, white wedding rings, and diamond encrusted delights are available for modern couples who want to express themselves with exceptional pieces of jewelry, and so shopping for wedding rings just got more fun. In 2018, leading wedding jewelry designers such as MADANI Rings have enhanced their collections with colorful gemstones and highly textures pieces. Two-tone wedding bands, combining classic yellow, rose or white gold with tungsten or cobalt, are both eye-catching and beautiful, and due to the durability to the metals used, they are made to last a lifetime. For those looking for a little bit of sparkle, wedding rings with black diamonds, chocolate diamonds, or dazzling pink sapphires lend just the right amount of shimmer to any ensemble, and they work beautifully with both traditionally styled engagement rings and modern eternity bands. Your wedding day is important, but so is your happy ever after, so choose your wedding rings wisely, and say ‘I do’ in style.